We will be running 2, 5 day training intensives for children (4-12 years old) from the 19th to 23rd December. Doing this type of training really helps to instill fundamentals in students. 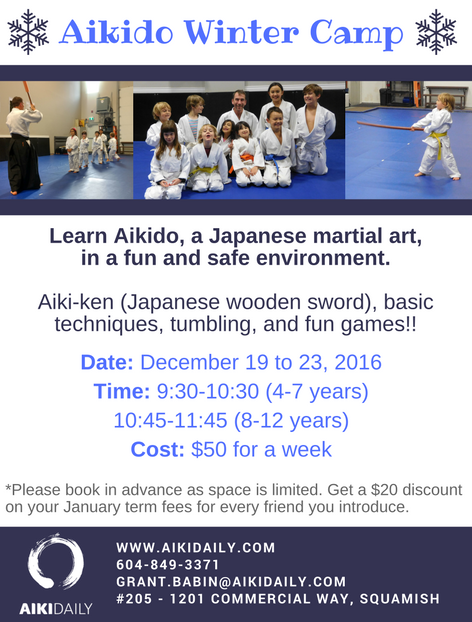 We will also be introducing the kids to the bokken, a wooden sword, that is used to develop a good understanding of timing, distance and body movement in Aikido. This camp is open to non members. Please let us know as soon as possible if you would like to sign your child up as space is limited. *Get a $20 discount on your January term fees for every friend you introduce!